The new SpringHill Suites Milwaukee Downtown is the newest and closest hotel to the Wisconsin Center, connected via skywalk and located directly across the street. Our hotel in Downtown Milwaukee is just two blocks from the BMO Harris Bradley Center, less than one mile from Marquette University and just minutes from the Henry W. Maier Festival Park and the Historic Third Ward District. 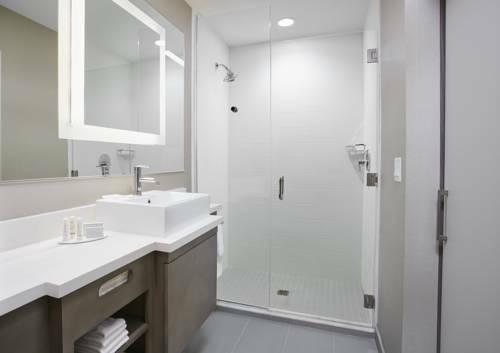 Our all-suite accommodations seamlessly blends design and functionality offering the modern amenities you need to stay refreshed and focused - all at an affordable price. Take the stress out of travel with our spacious suites equipped with free WiFi and 24-hour fitness center with state-of-the-art cardio equipment. Enjoy free hot breakfast with fresh choices for a customized start to your day - like eggs with local salsa or Greek yogurt and oatmeal complete with a toppings bar. Dine daily in Doc's Commerce Smokehouse restaurant and bar, located on-site. Doc's Smokehouse: New spot for authentic southern-style barbecue. Meats smoked with hickory - when they're out, theyr'e out! 60 craft beers on tap, 100 bourbons and whiskeys.